Turkish rabbi; flourished at Adrianople in the first half of the eighteenth century. He was a descendant of R. Joseph Caro, and was the stepson and pupil of R. Eliezer b. Jacob Naḥum, author of "Ḥazon Naḥum" (Constantinople, 1743-45), whom he probably succeeded as rabbi of Adrianople. 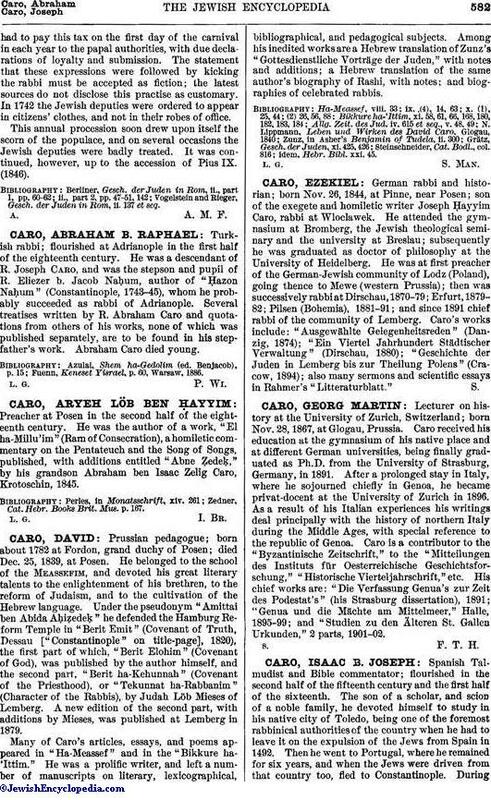 Several treatises written by R. Abraham Caro and quotations from others of his works, none of which was published separately, are to be found in his step-father's work. Abraham Caro died young. Fuenn, Keneset Yisrael, p. 60, Warsaw, 1886.